The Rockford Peaches women&apos;s baseball team was founded in 1943 as part of the All-American Girls Professional Baseball League (AAGPBL). The Peaches were a founding member of the league, and called Beyer Stadium in Rockford, Illinois their home. During the time of the AAGPBL, the Rockford Peaches were one of the most successful teams as they won the league championship os 1945, 1948, 1949, and 1950. The Rockford Peaches became immortalized through the 1992 movie A League of Their Own starring Tom Hanks, Geena Davis, Madonna and Rosie O&apos;Donnell. The Peaches continued to play in the AAGPBL until the league ended in 1954. Today, Rockford residents and visitors can enjoy learning about the Rockford Peaches at Midway Village Museum. There is an exhibit called "The Girls of Summer" where the museum highlights historical artifacts and even an original Rockford Peaches uniform in the museum. 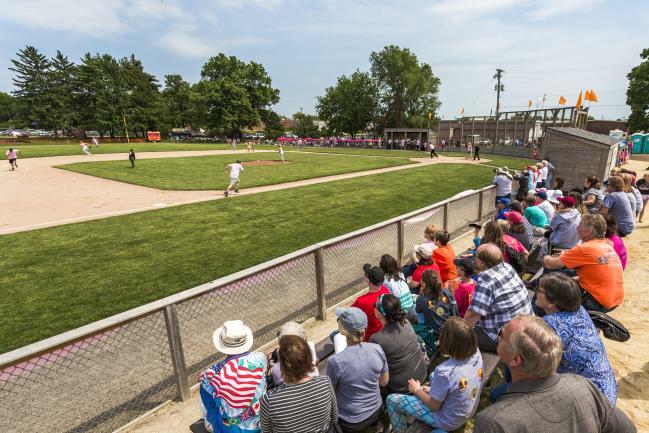 Guests can also visit the original Beyer Stadium in Rockford to see where the Peaches played. A group called the Friends of Beyer Stadium helped restore the original field and added historical markings and signs to the area. The International Women&apos;s Baseball Center (IWBC), in partnership with the Friends of Beyer Stadium, presented a series of fun, family-friendly events on May 30-June 3, 2018 to celebrate the Rockford Peaches’ 75th Anniversary and the All-American Girls Professional Baseball League (AAGPBL). The weekend&apos;s events included the Diamonds, Denim & Stars Fundraiser event, Rockford Peaches Day at Rockford City Market, a showing of A League of Their Own at Friday Night Flix, and a variety of celebrity and guest baseball events held at Beyer Stadium.